Prime Minister Manmohan Singh has told chief ministers from 29 Indian states to end exploitation of tribal people. Speaking at a conference in Delhi, Mr Singh said there had been a "systematic failure" to give tribal people a stake in India's modern economy. He said this was fomenting discontent, making them vulnerable to Maoists. The fight with Maoist rebels, India's biggest security threat, is being lost, the PM says. 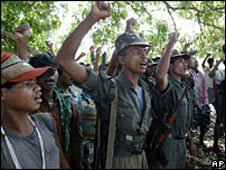 The rebels say they are fighting for rights for the rural poor. More than 6,000 people have been killed during their 20-year struggle for a communist state. 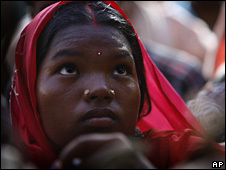 Tribal people often face discrimination from government and local officials in India. Mr Singh said indigenous groups, who live mainly in forests, were not taken into account when considering the development of these areas. "There has been a systematic failure in giving the tribals a stake in the modern economic processes that inexorably intrude into their living spaces," he told the conference of chief ministers and state ministers of tribal affairs. "The alienation built over decades is now taking a dangerous turn in some parts of our country. The systematic exploitation and social and economic abuse of our tribal communities can no longer be tolerated." Mr Singh said there had to be a more inclusive policy that respected the culture of each tribe. "The state should endeavour to give a healing touch to the tribal communities. "Their integration into the development processes is highly important. But this should not become a means of exploitation or be at the cost of their unique identity and their culture," he said. The prime minister also sent an apparent message to the Maoists, saying "no sustained activity is possible under the shadow of the gun". "Nor have those who claim to speak for the tribals offered an alternate economic path that is viable." Mr Singh said India had to win the battle for tribal people's hearts. "It cannot be said that we dealt sensitively with these issues in the past. More could be done and more should be done."